(July 28, 2017) In Mecklenburg County, road projects (including widening or otherwise improving existing roads as well as constructing new roads) go through a series of planning steps starting with a wish list (the Comprehensive Transportation Plan, or CTP) and continuing through to having funding committed (in the State Transportation Improvement Program, or STIP). During each step, local planning staff with the Charlotte Regional Transportation Planning Organization, or CRTPO, and the North Carolina Department of Transportation, or NCDOT, evaluate and prioritize each project, which determines whether it moves on to the next step. Most steps include opportunities for public participation and input. These steps may include other transportation projects, such as rail, public transportation, bicycle, and pedestrian projects. The following discussion focuses on highway and other road projects in Steele Creek. To ensure that proposed right-of-ways are protected from future development. CRTPO reviewed and updated the local CTP in 2016 and approved the current CTP in January 2017. The North Carolina Board of Transportation adopted the CTP in March 2017. The CTP includes improvements to numerous roads within Steele Creek. It also includes the following new roads, which are numbered on the map below. See the full map HERE. A new thoroughfare through the planned River District connecting to a new bridge across the Catawba River. This previously had been the Garden Parkway freeway but has been downgraded to a major thoroughfare. A new alignment for West Boulevard due to a planned new airport runway. But it also shows improvements to Douglas Drive and Pine Oaks Drive, which may be the new West Boulevard location. A new road connecting Arrowood Road with Shopton Road. Also a new road connecting Arrowood Road to Whitehall Park Drive with an overpass over I-485. An extension of Carowinds Boulevard west of South Tryon Street at John Price Road, along the north side of the Crossings neighborhood, connecting with Sam Neely Road, continuing along a reserved right-of-way through Planters Walk, and then following Winget Road to Shopton Road West. A new road connecting Choate Circle to South Tryon Street at Corsica Forest Drive. Part of this is currently being built by developers of a new apartment complex on South Tryon Street. A new alignment of Youngblood Road (Shopton Road West extension) between South Tryon Street and Zoar Road. An extension of Shopton Road east of South Tryon Street continuing to Nations Ford Road and Archdale Road, including an overpass over I-77. See also Opportunity for Public Involvement for Comprehensive Transportation Plan (July 26, 2016). The MTP includes projects for which revenue is expected to be available within the upcoming 25 years. 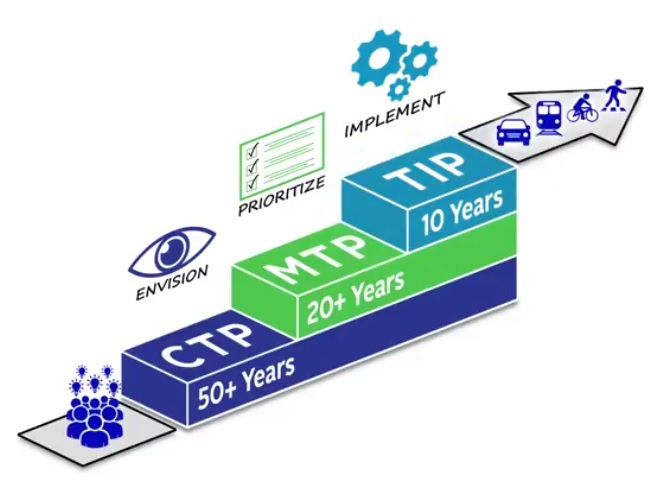 CRTPO adopted the 2040 MTP in April 2014 and currently is preparing the 2045 MTP. Projects are prioritized and grouped by horizon years, which implies that there will be funding available to complete the projects by the horizon year. Horizon year 2025 includes projects that are already funded and scheduled for construction in the next few years. Additional future projects are listed under horizon years 2035 and 2045. CRTPO is accepting comments on the list of projects in its 2045 MTP through August 3. See Comment Period Open for Metropolitan Transportation Plan. Improve Steele Creek Road/Hamilton Road intersection with turn lanes and bicycle and pedestrian accommodations. Convert the intersection of Beam Road and Shopton Road to a roundabout with bicycle and pedestrian accommodations. Widen Steele Creek Road from I-485 to the South Carolina state line to 4 lanes with bicycle lanes and sidewalks. Extend West Boulevard from I-485 to Dixie River Road as a 4-lane road with a multi-use path. Extend Carowinds Boulevard west from South Tryon Street to Steele Creek Road by improving existing roadways and constructing new roadways. It will be a 2 lane roadway with median, bike lanes, and sidewalks. Widen I-77 from I-485 to I-277 (Belk Freeway) from 6 lanes to 10 lanes, including express lanes. Widen South Tryon Street from 4 lanes to 6 lanes from I-485 to Steele Creek Road, including a median and a multi-use path. Widen Westinghouse Boulevard from 4 lanes to 6 lanes, including a median, bike lanes, and sidewalks from South Tryon Street to Nations Ford Road. Widen I-485 through Steele Creek from I-77 to I-85 from 6 lanes to 8 lanes, including express lanes. Widen South Tryon Street from Shopton Road to I-485 from 4 lanes to 6 lanes with median and multi-use path. Widen Steele Creek Road from I-485 north to the new Western Parkway from 2 lanes to 4 lanes with median, bike paths, and sidewalks. Build a new Western Parkway from Steele Creek Road to Billy Graham Parkway as a 4 lane road with a median and multi-use path. There will be another opportunity for public input early in 2018, and CRTPO is scheduled to adopt the 2045 MTP in March 2018. Prioritization is NCDOT's decision making tool that quantitatively evaluates projects to be considered for the next Transportation Improvement Program (TIP). CRTPO recommends projects, NCDOT scores the projects, and CRTPO applies local input points using a methodology that includes qualitative, quantitative, and local involvement components. During the comment period for Prioritization 3.0, CRTPO received 37 comments, of which about three fourths were in support of Highway 160 projects. 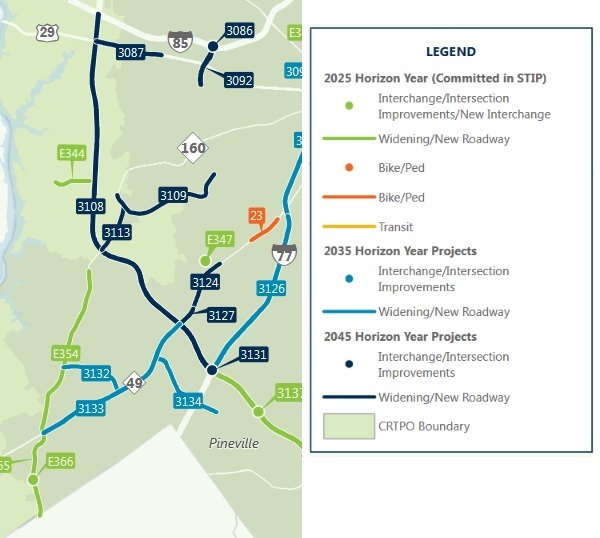 Widening Highway 160 from Shopton Road West to Highway 49 and improvements to the Highway 160/Hamilton Road intersection received local input points from CRTPO, but the widening of Highway 160 from Highway 49 to the South Carolina state line did not. The Prioritization 3.0 process was completed in fall 2014. The Widening of Highway 160 from Highway 49 to the South Carolina state line was evaluated during the Prioritization 4.0 process two years later and scored well enough to move up to be on the same schedule as that part of Highway 160 north of Highway 49. Prioritization 5.0 is now underway. 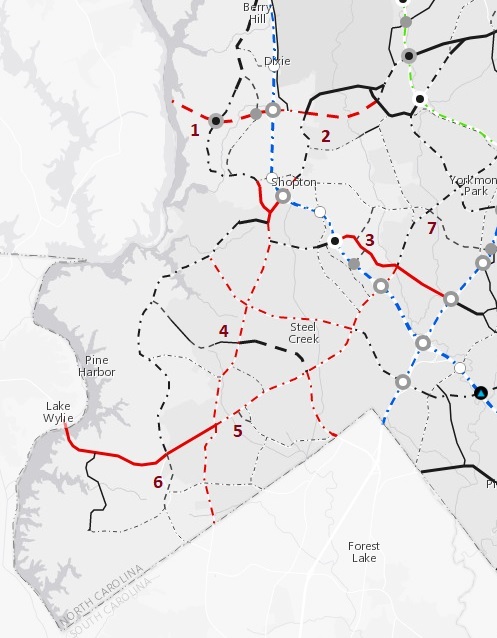 Projects have been identified for scoring, and the only highway project being considered in the Steele Creek area is the widening of I-77 to 10 lanes north of I-485. However, the Walker Branch Greenway between Steele Creek Road at Sledge Road and Smith Road is on the list of potential bicycle and pedestrian projects. The STIP is a statewide list of projects released by NCDOT that realistically can be funded within the upcoming 10 years. Projects scheduled to begin right-of-way acquisition or utility relocation in the first 5 years of the STIP are considered committed and not subject to reprioritization. Projects scheduled to begin after the first 5 years are subject to reprioritization. The Transportation Improvement Program (TIP) includes the projects on the statewide list within the local CRTPO area. Improve the intersection of Highway 160 and Hamilton Road with turn lanes, sidewalks and other features consistent with the future widening of Highway 160. Construction is scheduled to begin in 2018. Widen Highway 160 from Shopton Road West to Highway 49 to 4 lanes with a grassy median, bike lanes, and sidewalks. Right-of-way acquisition and utility relocation was scheduled to begin in 2020, with construction occurring in 2022 and 2023. The widening of Highway 160 from Highway 49 to the South Carolina state line was not included on the 2016-2025 STIP. 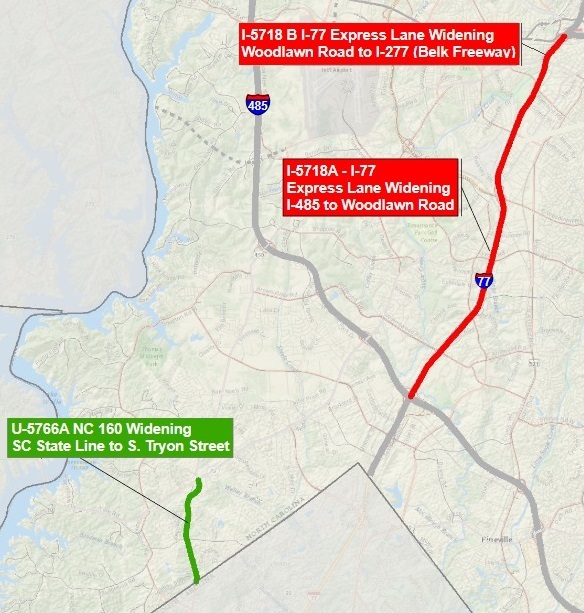 Widen Highway 160 from Highway 49 to the South Carolina state line with right-of-way acquisition beginning in 2019 and construction beginning in 2021. Acceleration of the beginning of the widening of the entire length of Highway 160 from I-485 to the South Carolina state line. Right-of-way acquisition and utility relocation is now scheduled to begin in 2019, and construction is scheduled to begin in 2021 and continue through 2024. If approved, this project would not be subject to reprioritization. Widen I-77 from I-485 to I-277 from 6 lanes to 10 lanes including 2 managed lanes in each direction. Preliminary right-of-way acquisition start date is 2024 and preliminary construction start date is 2027. Since this project is scheduled to begin after the first 5 years of the STIP, it is not committed and is subject to reprioritization. NCDOT’s Board of Transportation will adopt the STIP in August, and CRTPO will be required to adopt the 2018-2027 TIP by September of 2017. CRTPO is accepting comments to the local 2018-2027 DRAFT TIP through August 9. See Comment Period Open for Highway 160 Project. The map below shows the projects in draft 2018-2027 STIP in southwestern Mecklenburg County. The map showing all the projects in Mecklenburg County can be viewed HERE. Steele Creek residents will have opportunities to provide input in local projects as each of these plans is updated in the future.